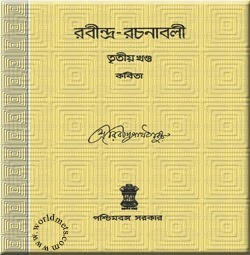 Rabindra Rachanabali (Poem) Volume- 3 of Rabindranath Tagore. Book Volume- 3 and Part- 2. Rabindra Rachanabali (Poem) Vol- 3 New edition of Rabindranath Tagore. The publication of a talented literary and his literary works, especially the books whose books have never been rarely involved, are not usually included in the public publishing initiatives. In view of this, the initiative to publish the present Rabindranath Tagore writings is undoubtedly a bright exception to the government’s activities. In 1961, the Bengal State Government published the version of Rabindra-Rachanabali (Poem) at a cheap price, a special occasion was the celebration of hundred year birth anniversary of the Rabindranath Tagore. But this time there is no festival environment in the background of the Rabindra-Rachanabali (Poem) publication, but the government has decided to publish this book at the urging of an opposite need. There is no hesitation to say that today’s narrow-minded separation and false values ​​against healthy life are going to tarnish our human appeal, where Rabindranath is our ultimate resort. That’s why Rabindranath’s writings need to be conveyed to the larger public. So this book was compiled again. This larger book has been divided into two parts and given on our website. The reader can easily download the book. On the other hand, the huge volume was not completed till the overall compilation of the literature of Rabindranath. However, those who were associated with the publication of Rabindra Sahitya compilation from Rabindranath’s lifetime, and fortunately some of them are still active in this compilation. Through the release of this version of Rabindra-Rachanabali with the help of them, the state government has tried to complete the work of compiling Rabindra-composition. The importance of writing, compiling and publishing Rabindra-written specially entrusted to Rabindranath’s immediate aftermath. As soon as the time comes, the complete collection and compilation of Rabindra composition will become complex and difficult. Compassionate manpower on the day of difficult tests of human values ​​today is committed to building a healthy society by not accepting the endless, uncontrollable outcome of humanity, if the Rabindranath’s writings are able to save their energy, the government’s determination and project will be considered as successful. Beginning with the introduction of the first volume of the present reform of the writings, the first volume of “Poetry” was planned till the last text, according to the poetry’s publication, by introduction of the first volume of the current reform, Swaran (Memorization) from the first volume Sangeet (Music), from the second part to the final and Shesh Lekha (The last text) was included into Third Sections. In the earlier section of 1882, the three compositions of poetry Kabi-Kahini (1878), Bonafool (1880) and Soisab Sangeet (childhood music) (1884), which Rabindranath did not publish in his lifetime as separate books, were included in the first section of Appendix in the current volume of the essay. Rabindranath Tagore wrote about the role in this book that Gitanjali’s songs have been translated into English, this translation is considered in poetry category. Until then, the poet had a question that whether it is possible to give poetry to Bangla in the same way as English without having a clear distraction of verse. He requested Satyendranath, and he confessed. But did not try anymore. Then the poet himself has examined himself, he has few writings in the script. The sentences were not broken like verse when printed. It seems to be the cause of fear. After this, Abanindranath Tagore became involved in this effort by the author’s request. According to the poet, his writings came in the boundaries of poetry, not only for the language but also for the quantity. And once the effort was made by the author. One thing can be said on this occasion, it is not enough to break the string of rhyme in poetry, it can be normal only if it eliminates the fact that there is a provision in the language and expression of the poetry, and also in the free from prosecution. Writing poetry written in this book, the author believes that it will be possible to extend the rights of poetry to a far greater degree than the unreasonable prose. Some of these poems are incompatible, but they have tried to abandon the special lingu of the verse. These poems did not give place to poetry, such as Taare, Sane and More which are not used in prose. This larger book Rabindra Rachanabali (Poem) Volume- 3 has been divided into two parts and given in our website. The reader can easily download the book from this page here.